Guess the Food: Real Fruit! It has been a bit since I’ve done a Guess the Food so I thought I would bring it back in the new year with a “food” that is almost certainly healthy. Just look at all of these amazing claims! How could it not be good for you?! As you might guess, anytime you see bright bold claims on “food” it’s probably not a lie but it’s definitely not the whole story. Let’s dig into some of the nutritional facts and ingredients here and see if you guys can guess the “food”! Cholesterol Free! So what? Lots of stuff is cholesterol free including gasoline. Having high cholesterol can make a food unhealthy, but being cholesterol free doesn’t make something healthy. Baked with Real Fruit* Anytime you see an asterisk next to a phrase, watch out. It’s probably not good. If you hunt down the asterisk explanation in this case it says, “Made with Equal to 10% Fruit.” I have no idea what the hell that means. As you’ll see in the ingredients though, there is less fruit in this thing than salt (by weight). In other words, it’s not very much fruit. Holy hell that’s a lot of stuff! Let’s not go through all of them because I don’t want to write a novel here. Enriched Flour – As I’ve said many times on these posts, enriched flour isn’t enriched with anything. They take normal flour, strip out all the good stuff to make for a longer shelf-life and then add back some nutrients, therefore enriching it. Fantastic. Corn syrup, high fructose corn syrup, dextrose – These are all various sugar products that are in pretty much everything found in a box in the store. Oils with TBHQ for freshness – This TBHQ stuff is in a lot of very processed foods. It is tert-Butylhydroquinone. Say that tens time fast! It’s a preservative that has some skeptical at best lab results and some reports have said it could be carcinogenic. It’s generally deemed safe in super-small doses though. Dried Blueberries, Apples, Grapes – Here’s that fruit! Notice that it comes after salt in the ingredients list which means, by weight, there is more salt than these things. Gelatin – I didn’t realize these weren’t vegetarian. Partially Hydrogenated Soybean Oil* – Another thing with an asterisk, or a cross I guess. 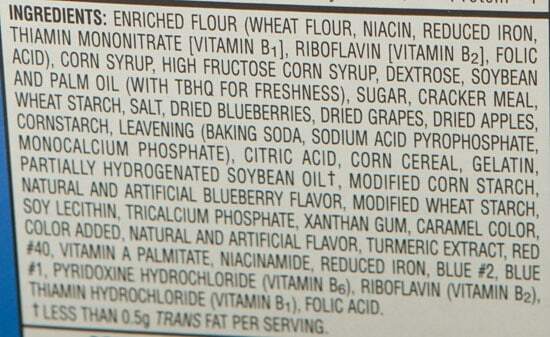 This is basically solid oil and is a lead provider of trans fats which have all sorts of negative health effects. 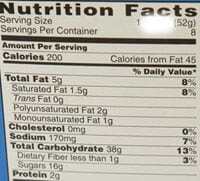 In fact, trans fats are restricted in many countries and some states. They keep the amount under .5g per serving though so they can round down on the nutritional panel and say it has ZERO grams. Soy Lecithin – This has to be one of the most common food additives. It’s in everything and seems fairly harmless. It’s basically an emulsifier and thickener. Tricalcium Phosphate – A common salt that’s used frequently as an anti-caking agent. At the very end of the ingredients list you can see where they add in all those special vitamins so they can slap meaningless phrases on the front of the box. OK. So I’m obviously not a huge fan of this “food” even though I’ve eaten my fair share of it in my lifetime. The question, of course, is if you can GUESS THE FOOD? LEAVE A COMMENT! I agree, It has to be pop tarts. If not pop tarts, then some sort of cereal bar. I would guess pop tart or cereal bar too! If everyone else hadn’t already said pop tart, I would have said a fruit danish. But pop tart is probably the right answer. Yucky, pop tarts. I am forwarding this post to my kids at college. They eat them for breakfast. Not so smart. There’s not even enough blueberries in those BLUEBERRY Pop-Tarts to make them taste like blueberry. They had to add artificial flavors to it. They also taste really gross, so I don’t eat them anyway. But that’s not breakfast. That’s a cookie! Pop-Tarts, box of eight. Even though it says serving size one, they still want you to eat two at a time! Yep! Isn’t that crazy that they package them in twos but a serving size is one? Makes no sense. PopTarts. I was not impressed by them as a kid. Well, that’s embarrassing! They changed their box design! I was going to say something like Berry Kix or some sort of “berry” cereal. I knew it was pop-tarts as soon as I saw the gelatin. They use it in the weird “frosting” that they put on the top. You’ll also find gelatin in most cereals with marshmallows (like Lucky Charms) and yogurt.